VANCOUVER, BC--(Marketwired - December 12, 2016) - Skeena Resources Limited (TSX VENTURE: SKE) ("Skeena" or the "Company") is pleased to report the commencement of a National Instrument 43-101 ("NI 43-101") Preliminary Economic Assessment ("PEA") and the release of final 2016 drilling results on the newly expanded Spectrum-GJ gold-copper property ("Spectrum-GJ") in the Golden Triangle of northwest British Columbia, Canada. Metallurgical, mineral resource modelling, mining and environmental studies are underway that will provide the basis for the PEA to be released in Q2 2017. The PEA will include updated NI 43-101 mineral resource estimates that incorporate the 2016 definition drilling results reported below. Roscoe Postle Associates Inc. ("RPA") has also been engaged as an independent third party to review and audit the PEA and its outcomes. Current NI 43-101 mineral resource estimates are available on SEDAR and the Company website for the Donnelly deposit of the GJ property ("GJ Donnelly Deposit") (G.R. Peatfield, P.Eng., G.H. Giroux, P.Eng., and M.S. Cathro, P.Geo., April 11, 2016) and the Central zone of the Spectrum property ("Spectrum Central Zone") (J.R. Stacey, P.Geo. and G.H. Giroux, P.Eng., May 31, 2016). In 2016, 2,872 metres were drilled in 8 holes at GJ Donnelly Deposit, and 6,279 metres were drilled in 22 holes at Spectrum Central Zone, in part to collect large diameter core samples for metallurgical test work and to also better define the grade and dimensions of the mineralization within the target mining areas. 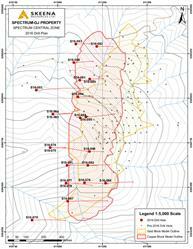 Complete assay information, a drill plan and list of collar positions are available on the Skeena website. 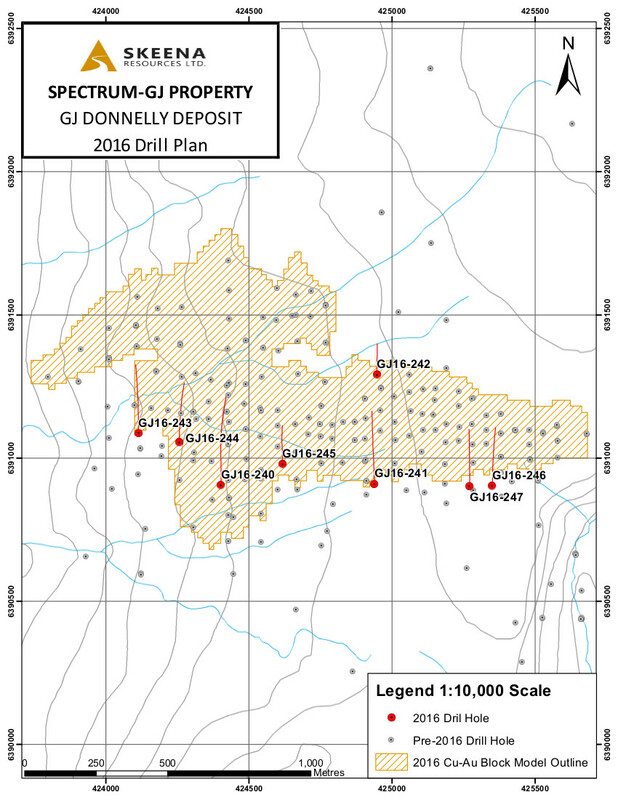 Several holes at GJ Donnelly Deposit successfully extended the mineralized zone to depth, with gold and copper values higher than the current average mineral resource grades (see Spectrum-GJ 2016 Drill Results - GJ Donnelly Deposit on the Company's website), including hole GJ16-245 which intersected 102.3 m grading 0.47 g/t Au and 0.29 % Cu beginning at 276.6 m. (Note: all intervals reported here are uncut, down-hole measurements. True widths are estimated to be between 65% and 90% of drilled widths). Drilling at Spectrum Central Zone was focused on a panel of porphyry gold-copper mineralization on the west and south side of the deposit, which had sparse drill coverage historically due to topographic constraints and difficult drilling conditions. The drilling successfully cut thick intervals of low to moderate-grade gold-copper mineralization, as predicted by geological interpretation. S16-095, intersected a wide interval of 224.9 m grading 0.79 g/t Au and 0.12% Cu beginning at 23.2 m below surface (see Spectrum-GJ 2016 Drill Results - Spectrum Central Zone). This includes a higher-grade interval of 181.0 m grading 0.94 g/t Au and 0.13% Cu, which includes 62.0 m grading 1.45 g/t Au and 0.11% Cu. Other highlight holes include S16-090 which intersected 62.2 m grading 0.97 g/t Au and 0.20 % Cu, S16-092 with 69.0 m grading 0.73 g/t Au and 0.20% Cu, and S16-077 with 73.0 m grading 0.97 g/t Au and 0.26% Cu (previously reported on August 24, 2016). Unfortunately, three holes (S16-074, 084 and 085) were lost in faulted ground above or just after entering the mineralization, and thus did not test the full width of the zone. For example, hole S16-085 intersected 12.0 m grading 2.41 g/t Au, 0.05% Cu and 20.5 g/t Ag from 236.0 m to 248.0 m, before the hole was abandoned at 250.0 m. Holes S16-088 and 095 were drilled in front (east) of holes S16-084 and 085 and successfully cored the target zone. The new drill data will allow for estimation of mineral resources within the western portion of Spectrum Central Zone, part of which was previously counted as waste or low-grade inferred mineralization in the 2016 NI 43-101 mineral resource estimate, due to lack of drilling. This should increase the tonnage of run-of-mine mineralized material and reduce the strip ratio on mining. The gold-copper mineralization in Spectrum Central Zone occurs in a moderately west-dipping panel with a strike length of 1,600 m in a north-south direction, and up to 240 m in true thickness. It is open below the limit of drill testing at 250 m to 450 m down dip, or a maximum of 400 m below surface. 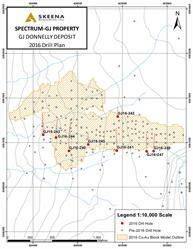 The 2016 Spectrum-GJ program also included prospecting (929 rock samples), soil surveys (1,001 samples), 15.6 km of induced polarization surveying on seven lines over Spectrum Central Zone, a 25.6 km ground magnetic survey and drilling of two holes on outlying targets. West Creek: A single hole, S16-080, tested the West Creek prospect, which is located 3.5 km southwest of Spectrum Central Zone and has not been previously drilled. Promising bulk tonnage and high-grade, gold-copper-silver values were encountered. The hole intersected 23.4 m, beginning at 108.3 m, grading 1.54 g/t Au, 0.20% Cu and 7.8 g/t Ag, including 1.8 m grading 14.85 g/t Au, 0.75% Cu and 58.5 g/t Ag (see Spectrum-GJ 2016 Drill Results - Spectrum West Creek Target). Further drilling is warranted. 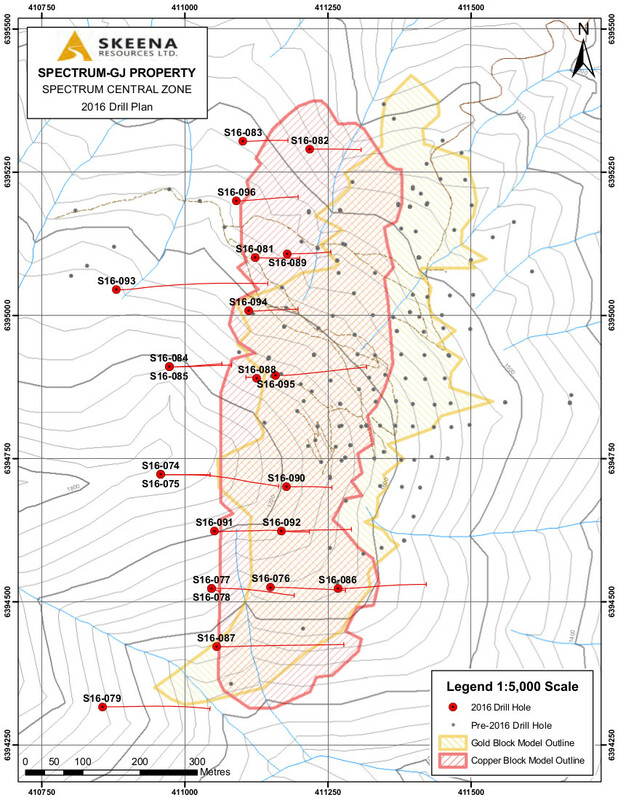 South Copper: A single 2016 drill hole tested a previously undrilled 150 m by 200 m coincident magnetic high and copper-gold soil and rock geochemical anomaly that lies 450 m south of Spectrum Central Zone. This hole, S16-097, intersected weakly anomalous gold and copper values, including 14.0 m grading 0.35 g/t Au and 0.08% Cu. Although grades are low, the mineralization is associated with porphyry-style alteration and quartz-sulphide veining similar to the Spectrum Central Zone porphyry, which indicates exploration potential for the South Copper area (see Spectrum-GJ 2016 Drill Results - Spectrum South Copper Target). The Company has acquired a 50% working interest in 3 adjacent mineral claims totaling 1,298.8 hectares by purchase agreement with Colorado Resources Ltd. The purchase of these rights make the GJ and Spectrum properties contiguous and will allow for simpler exploration, development and access permitting in the future. The expanded Spectrum-GJ property now totals 43,410 hectares and extends as far as Highway 37 and the 287kV Northwest Transmission Line. The scientific and technical information contained in this news release has been reviewed and approved by Michael Cathro, P.Geo. Skeena's VP of Operations, a Qualified Person as defined by National Instrument 43-101. A rigorous chain-of-custody and quality assurance/quality control program, consisting of the insertion of certified standard control samples, duplicates and blanks, was applied to the NQ-diameter, split half-core samples. Sample preparation and analyses for the 2016 samples were completed at ALS Minerals in Kamloops and Vancouver. Gold is determined by 50-gram fire assay followed by an atomic absorption finish, or by gravimetric finish for samples over 10 g/t. Copper, silver and other elements are determined by an ICP analysis following aqua regia digestion. Samples with over 100 g/t silver or 1% copper are re-analyzed by a 4-acid digestion with atomic absorption finish. S16-074* Abandoned at 163 m before zone. No significant values. Skeena Resources Limited is a junior Canadian mining exploration company focused on developing prospective base and precious metal properties in the Golden Triangle region of northwest British Columbia, Canada. The Company's primary activities are the evaluation and development of the Spectrum-GJ gold-copper project as well as exploration on the recently optioned past-producing Snip gold mine, acquired from Barrick Gold, and the past-producing Porter Idaho silver mine. Skeena's management includes a highly experienced team of mine-finders, including Ron Netolitzky, Chairman of the Board. Certain statements made and information contained herein may constitute "forward looking information" and "forward looking statements" within the meaning of applicable Canadian and United States securities legislation, including, among other things, information with respect to this presentation. These statements and information are based on facts currently available to the Company and there is no assurance that actual results will meet management's expectations. Forward-looking statements and information may be identified by such terms as "anticipates", "believes", "targets", "estimates", "plans", "expects", "may", "will", "could" or "would". Forward-looking statements and information contained herein are based on certain factors and assumptions regarding, among other things, the estimation of Mineral Resources and Reserves, the realization of Mineral Resource and Reserve estimates, metal prices, taxation, the estimation, timing and amount of future exploration and development, capital and operating costs, the availability of financing, the receipt of regulatory approvals, environmental risks, title disputes and other matters. While the Company considers its assumptions to be reasonable as of the date hereof, forward-looking statements and information are not guarantees of future performance and readers should not place undue importance on such statements as actual events and results may differ materially from those described herein. The Company does not undertake to update any forward-looking statements or information except as may be required by applicable securities laws.